Identify the advantages and disadvantages of the ways to use presentation aids. Understand the range of choices for presentation aids. When you deliver a speech, you are presenting much more than just a collection of words and ideas. Because you are speaking “live and in person,” your audience members will experience your speech through all five of their senses: hearing, vision, smell, taste, and touch. In some speaking situations, the speaker appeals only to the sense of hearing, more or less ignoring the other senses. The speaking event can be greatly enriched by appeals to the other senses using presentation aids. Presentation aids are the resources beyond the speech itself that a speaker uses to enhance the message conveyed to the audience. The type of presentation aids speakers most typically use are visual aids: pictures, diagrams, charts and graphs, maps, and the like. Audible aids include musical excerpts, audio speech excerpts, and sound effects. A speaker may also use fragrance samples or food samples as olfactory (smell) or gustatory (taste) aids. Presentation aids can be three-dimensional objects, animals, and people, and they can unfold over a period of time, as in the case of a how-to demonstration. As you can see, the range of possible presentation aids is almost infinite. However, to be effective, each presentation aid a speaker uses must be a direct, uncluttered example of a specific element of the speech. It is understandable that someone presenting a speech about Abraham Lincoln might want to include a picture of him. However, because most people already know what Lincoln looked like, the picture would not contribute much to the message (unless, perhaps, the message was specifically about the changes in Lincoln’s appearance during his time in office). Other visual artifacts are likely to deliver information more directly relevant to the speech. For example, when giving a speech about Lincoln, a speaker may use a diagram of the interior of Ford’s Theater where Lincoln was assassinated, a draft of the messy and much-edited Gettysburg Address, or a photograph of the Lincoln family. The key is that each presentation aid must directly express an idea in your speech. Moreover, presentation aids must be used at the specific time you are presenting the ideas related to the aid. For example, if you are speaking about coral reefs and one of your supporting points is about the location of the world’s major reefs, it will make sense to display a map of these reefs while you’re talking about their location. If you display it while you are explaining what coral actually is, or after you have completed your speech, the map will not serve as a useful visual aid. In fact, it’s likely to be a distraction. Presentation aids must also be easy to use. At a conference on organic farming, one of the authors watched as the facilitator opened the orientation session by creating a conceptual map of our concerns, using a large newsprint pad on an easel. In his shirt pocket, there were wide-tipped felt markers in several colors. As he was using the black marker to write the word “pollution,” he dropped the cap on the floor, and it rolled a few inches under the easel. When he bent over to pick up the cap, all the other markers fell out of his pocket. They rolled about too, and when he tried to retrieve them, he bumped the easel, leading the easel and newsprint pad to tumble over on top of him. The audience responded with amusement and thundering applause, but the serious tone of his speech was ruined. The next two days of the conference were punctuated with allusions to the unforgettable orientation speech. Markers falling across the floor is not how you will want your speech to be remembered. To be effective, presentation aids must also be easy for the listeners to see and understand. In this chapter, we will present some principles and strategies to help you incorporate hardworking, effective presentation aids into your speech. We will begin by discussing the functions that a good presentation aid fulfills. Next, we will explore some of the many types of presentation aids and how best to design and utilize them. We will also describe various media that can be used for presentation aids and will conclude with tips for successful preparation and use of presentation aids in a speech. Presentation aids are the resources beyond the speech itself that a speaker uses to enhance the message conveyed to the audience. Why should you use presentation aids? If you have prepared and rehearsed your speech adequately, shouldn’t a good speech with a good delivery be enough to stand on its own? While it is true that impressive presentation aids will not rescue a poor speech, it is also important to recognize that a good speech can often be made better by the strategic use of presentation aids. Presentation aids can fulfill several functions: they can serve to improve your audience’s understanding of the information you are conveying, enhance audience memory and retention of the message, add variety and interest to your speech, and enhance your credibility as a speaker. Let’s examine each of these functions. Human communication is a complicated process that often leads to misunderstandings. If you are like most people, you can easily remember incidents when you misunderstood a message or when someone else misunderstood what you said to them. Misunderstandings happen in public speaking just as they do in everyday conversations. One reason for misunderstandings is the fact that perception and interpretation are highly complex individual processes. Most of us have seen the image in which, depending on your perception, you see either the outline of a vase or the facial profiles of two people facing each other. These types of images show how interpretations can differ. Your presentations must be based on careful thought and preparation to maximize the likelihood that your listeners will understand the intention of your presentation. As a speaker, one of your basic goals is to help your audience understand your message. To reduce misunderstanding, presentation aids can be used to clarify or to emphasize. Clarification is important in a speech because if some of the information you convey is unclear, your listeners will come away puzzled or possibly even misled. Presentation aids can help clarify a message if the information is complex or if the point being made is a visual one. If your speech is about the impact of the Coriolis effect on tropical storms, for instance, you will have great difficulty clarifying it without a diagram because the process is a complex one. 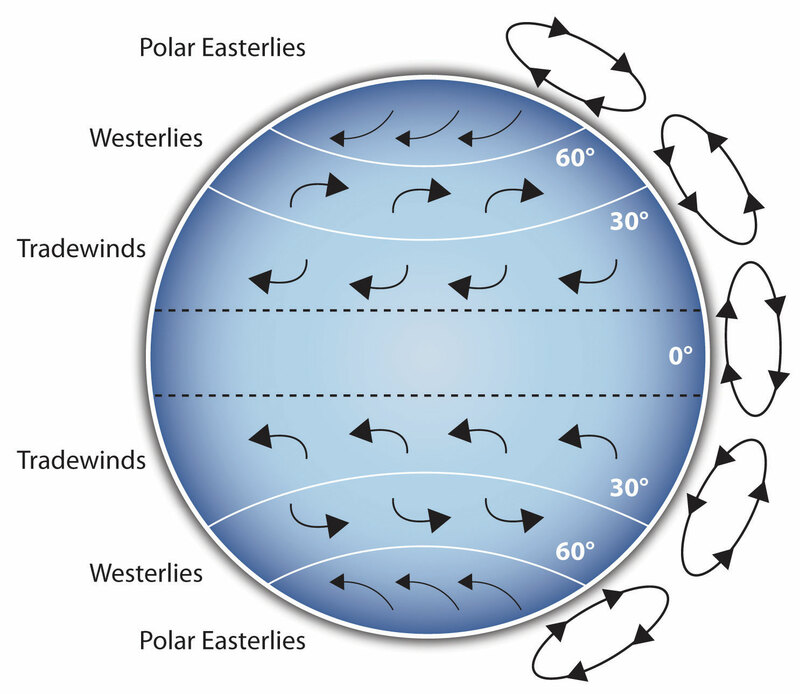 The diagram in Figure 1: The Coriolis Effect would be helpful because it shows the audience the interaction between equatorial wind patterns and wind patterns moving in other directions. The diagram allows the audience to process the information in two ways: through your verbal explanation and through the visual elements of the diagram. Figure 2: Model of Communication is another example of a diagram that maps out the process of human communication. 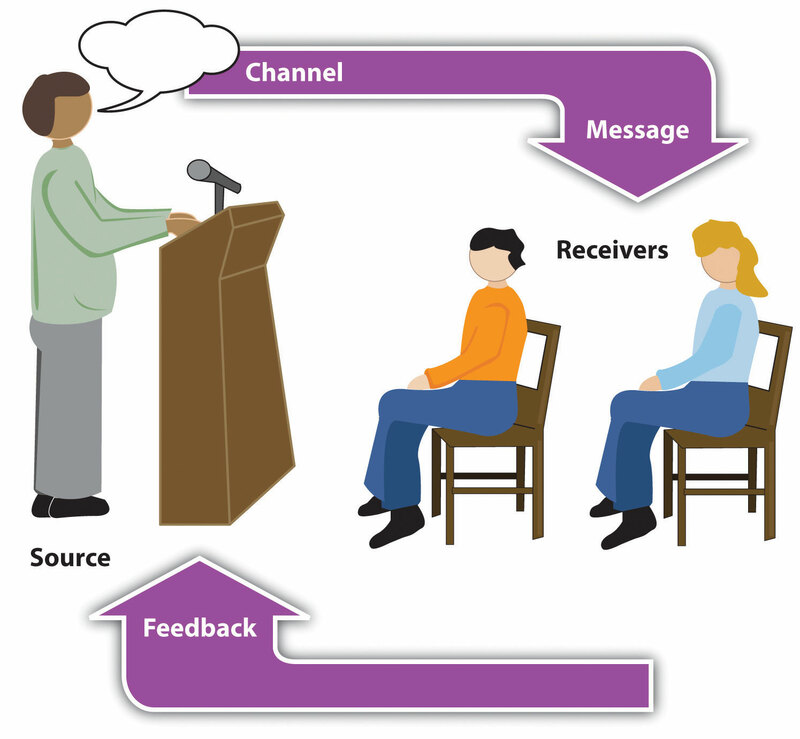 In this image, you clearly have a speaker and an audience (albeit slightly abstract), with the labels of the source, channel, message, receivers, and feedback to illustrate the basic linear model of human communication. Another aspect of clarifying occurs when a speaker wants to visually help audience members understand a visual concept. For example, if a speaker is talking about the importance of petroglyphs in Native American culture, just describing the petroglyphs won’t completely help your audience to visualize what they look like. 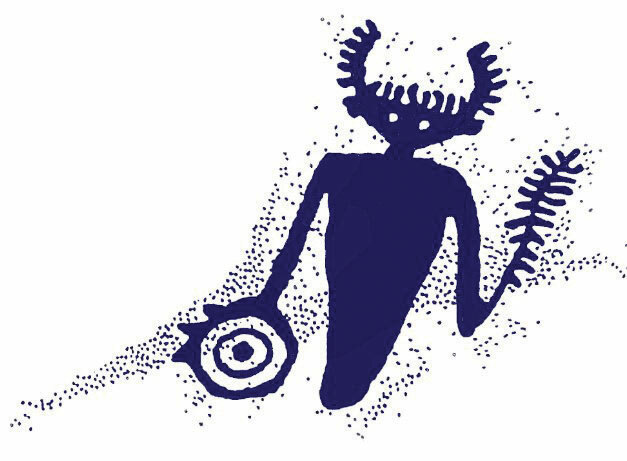 Instead, showing an example of a petroglyph, as in Figure 3: Petroglyph, could help your audience form a clear mental image of your intended meaning. When you use a presentational aid for emphasis, you impress your listeners with the importance of an idea. In a speech on water conservation, you might try to show the environmental proportions of the resource. When you use a conceptual drawing like the one in Figure 4: Planetary Water Supply, you show that if the world water supply were equal to ten gallons, only ten drops would be available and potable for human or household consumption. 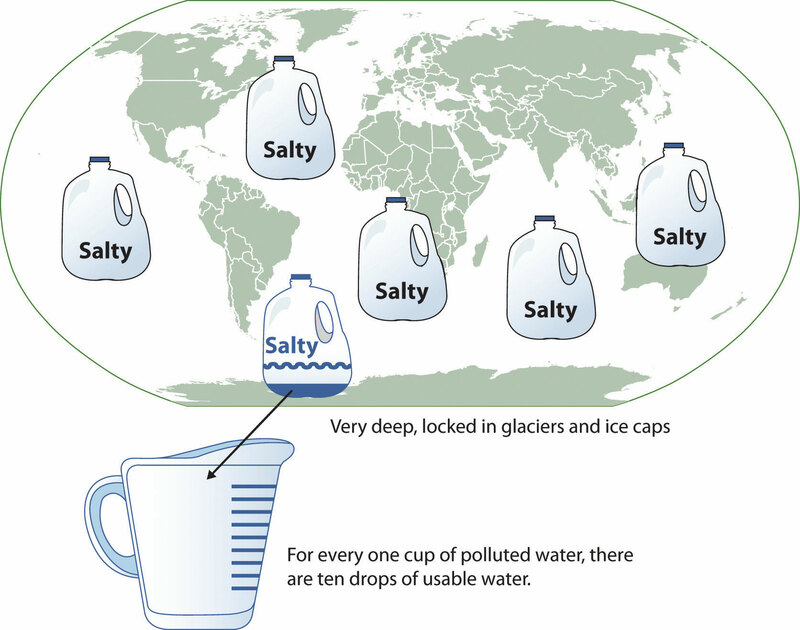 This drawing is effective because it emphasizes the scarcity of useful water and draws attention to this important information in your speech. Another way to visually emphasize information in your speech is to zoom in on a specific aspect of interest within your speech. 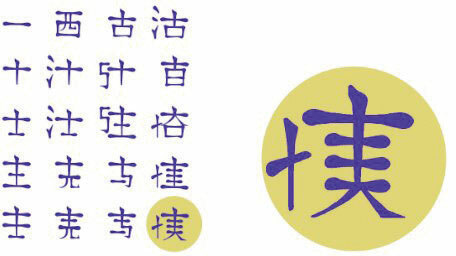 In Figure 5: Chinese Lettering Amplified, we see a visual aid used in a speech on the importance of various parts of Chinese characters. On the left side of the visual aid, we see how the characters all fit together, with an emphasized version of a single character on the right. Wikimedia Commons – public domain. The second function that presentation aids can serve is to increase the audience’s chances of remembering your speech. A 1996 article by the US Department of Labor summarized research on how people learn and remember. The authors found that “83% of human learning occurs visually, and the remaining 17% through the other senses—11% through hearing, 3.5% through smell, 1% through taste, and 1.5% through touch” (United States Department of Labor, 1996). Mostly, people learn through seeing things, so the visual component of learning is very important. The article goes on to note that information stored in long-term memory is also affected by how we initially learn the material. In a study of memory, learners were asked to recall information after a three day period. The researchers found that they retained 10 percent of what they heard from an oral presentation, 35 percent from a visual presentation, and 65 percent from a visual and oral presentation (Lockard & Sidowski, 1961). It’s amazing to see how the combined effect of both the visual and oral components can contribute to long-term memory. For this reason, exposure to a visual image can serve as a memory aid to your listeners. When your graphic images deliver information effectively, and when your listeners understand them clearly, audience members are likely to remember your message long after your speech is over. Moreover, people can remember information that is presented in sequential steps more easily than if that information is presented in an unorganized pattern. When you use a presentation aid to display the organization of your speech, you will help your listeners to observe, follow, and remember the sequence of information you conveyed to them. This organization is why some instructors display a lecture outline for their students to follow during class. An added plus of using presentation aids is that they can boost your memory while you are speaking. Using your presentation aids while you rehearse your speech will familiarize you with the association between a given place in your speech and the presentation aid that accompanies that material. For example, if you are giving an informative speech about diamonds, you might plan to display a sequence of slides illustrating the most popular diamond shapes: brilliant, marquise, emerald, and so on. As you finish describing one shape and advance to the next slide, seeing the next diamond shape will help you remember the information about it that you are going to deliver. The third function of presentation aids is to make your speech more interesting. While it is true that a good speech and a well-rehearsed delivery will already include variety in several aspects of the presentation, in many cases, a speech can be made even more interesting by the use of well-chosen presentation aids. For example, you may have prepared a great speech to inform a group of gardeners about several new varieties of roses suitable for growing in your local area. Although your listeners will undoubtedly understand and remember your message very well without any presentation aids, wouldn’t your speech have greater impact if you accompanied your remarks with a picture of each rose? You can imagine that your audience would be even more enthralled if you could display an actual flower of each variety in a bud vase. Similarly, if you were speaking to a group of gourmet cooks about Indian spices, you might want to provide tiny samples of spices that they could smell and taste during your speech. Taste researcher Linda Bartoshuk has given presentations in which audience members receive small pieces of fruit and are asked to taste them at certain points during the speech (Association for Psychological Science, 2011). Presentation aids alone will not be enough to create a professional image. As we mentioned earlier, impressive presentation aids will not rescue a poor speech. However, even if you give a good speech, you run the risk of appearing unprofessional if your presentation aids are poorly executed. Meaning, that in addition to containing important information, your presentation aids must be clear, clean, uncluttered, organized, and large enough for the audience to see and interpret correctly. Misspellings and poorly designed presentation aids can damage your credibility as a speaker. Conversely, a high-quality presentation will contribute to your professional image. Additionally, make sure that you give proper credit to the source of any presentation aids that you take from other sources. Using a statistical chart or a map without proper credit will detract from your credibility, just as using a quotation in your speech without credit would. If you focus your efforts on producing presentation aids that contribute effectively to your meaning, and look professional and are well handled, your audience will most likely appreciate your efforts and pay close attention to your message. That attention will help them learn or understand your topic in a new way and will thus help the audience see you as a knowledgeable, competent, credible speaker. As we saw in the example of the presentation at the organic farming conference, using presentation aids can be risky. However, with a little forethought and adequate practice, you can choose presentation aids that enhance your message and boost your professional appearance in front of an audience. One principle to keep in mind is to use only as many presentation aids as necessary to present your message or to fulfill your classroom assignment. Although the maxim “less is more” may sound like a cliché, it really does apply in this instance. The technical sophistication of your presentation aids should never overshadow your speech. Another thing to remember is that presentation aids do not “speak for themselves.” When you display a visual aid, you should explain what it shows, pointing out and naming the most important features. If you use an audio aid, such as a musical excerpt, you need to tell your audience a specific thing to listen for. Similarly, if you use a video clip, it is up to you as the speaker to point out the characteristics of the video that support the point you are making. A chart is a graphical representation of data (often numerical) or a sketch representing an ordered process. Whether you create your charts, or do research to find charts that already exist, it is important for them to exactly match the specific purpose in your speech. In the rest of this section, we’re going to explore three common types of charts: statistical charts, sequence-of-steps chart, and decision trees. For most audiences, statistical presentations must be kept as simple as possible, and they must be explained. Unless you are familiar with statistics, a chart may be very confusing. When visually displaying information from a quantitative study, you need to make sure that you understand the material and can successfully explain how one should interpret the data. If you are unsure about the data yourself, then you should probably not use this type of information. Figure 6: Effects of Smoking on Different Body Systems is surely an example of a visual aid that, although it delivers a limited kind of information, does not speak for itself. Wikimedia Commons – public domain; and Wikimeida Commons – public domain. Charts are also useful when you are trying to explain a process that involves several steps. The visual aid in Figure 7: Steps in Cell Reproduction depicts the process of cell division called mitosis using a sequence-of-steps chart. The chart labels the phases, which can help your audience understand the process. Decision trees are useful for showing the relationships between ideas. 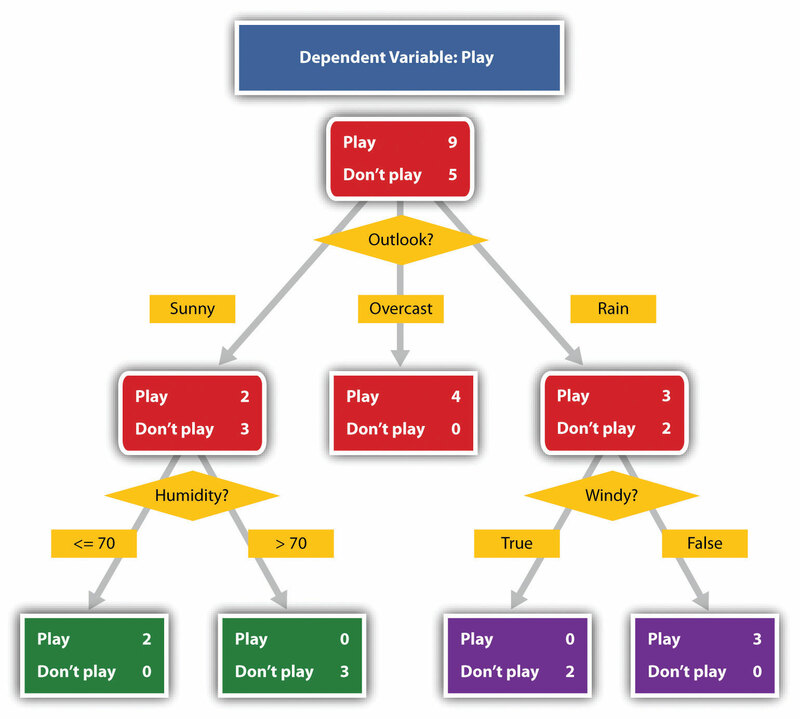 The example in Figure 8: To Play or Not to Play shows how a decision tree could be used to determine the appropriate weather for playing baseball. As with the other types of charts, you want to be sure that the information in the chart is relevant to the purpose of your speech and that each question and decision is clearly labeled. Strictly speaking, a graph may be considered a type of chart, but graphs are so widely used that we will discuss them separately. A graph is a pictorial representation of the relationships of quantitative data using dots, lines, bars, pie slices, and the like. Graphs show the variation in one variable in comparison with that of one or more other variables. Where a statistical chart may report the mean ages of individuals entering college, a graph would show how the mean age changes over time. A statistical chart may report the number of computers sold in the United States, while a graph will show the breakdown of those computers by operating systems such as Windows, Macintosh, and Linux. Public speakers can use graphs from a range of different formats. Some of those formats are specialized for various professional fields. Very complex graphs often contain too much information that is not related to the purpose of a student’s speech. If the graph is cluttered, it becomes difficult to comprehend. In this section, we’re going to analyze types of graphs speakers frequently utilize in their speeches: line graphs, bar graphs, and pie graphs. A line graph is designed to show trends over time. 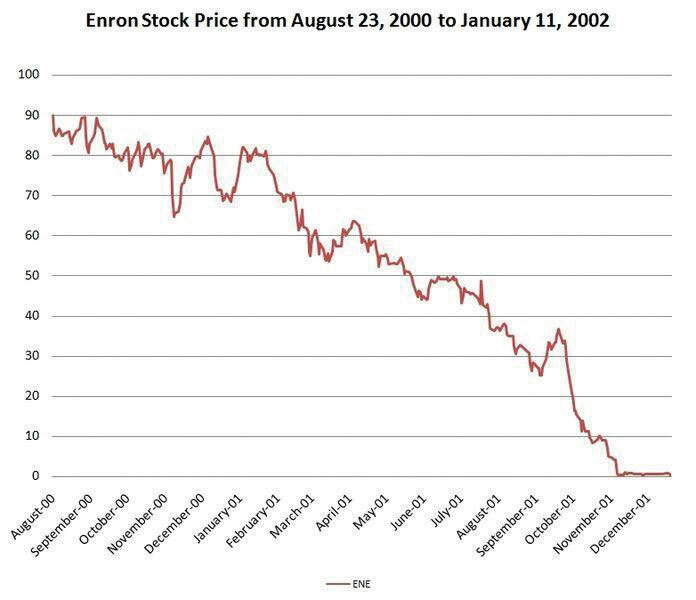 In Figure 9: Enron’s Stock Price, we see a line graph depicting the fall of Enron’s stock price from August 2000 to January 2002. Notice that although it has some steep rises, the line has an overall downward trend clearly depicting the plummeting of Enron’s stock price. Showing such a line graph helps the audience see the relationships between the numbers. The audience can also understand the information by seeing the graph much more easily than they could if the speaker just read the numbers aloud. Wikimedia Common – CC BY-SA 2.0. Bar graphs are useful for showing the differences between quantities. They can be used for population demographics, fuel costs, math ability in different grades, and many other kinds of data. The graph in Figure 10: Natural Death vs. Homicide is well designed. It is relatively simple and is carefully labeled, making it easy for you to guide your audience through the quantities of each type of death. 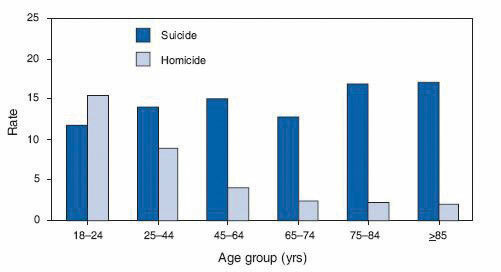 The bar graph is designed to show the difference between natural deaths and homicides across various age groups. When you look at the data, the first grouping clearly shows that eighteen to twenty-four-year-olds are more likely to die because of a homicide than any of the other age groups. Pie graphs should be simplified as much as possible without eliminating important information. As with other graphs, the sections need to be plotted proportionally. 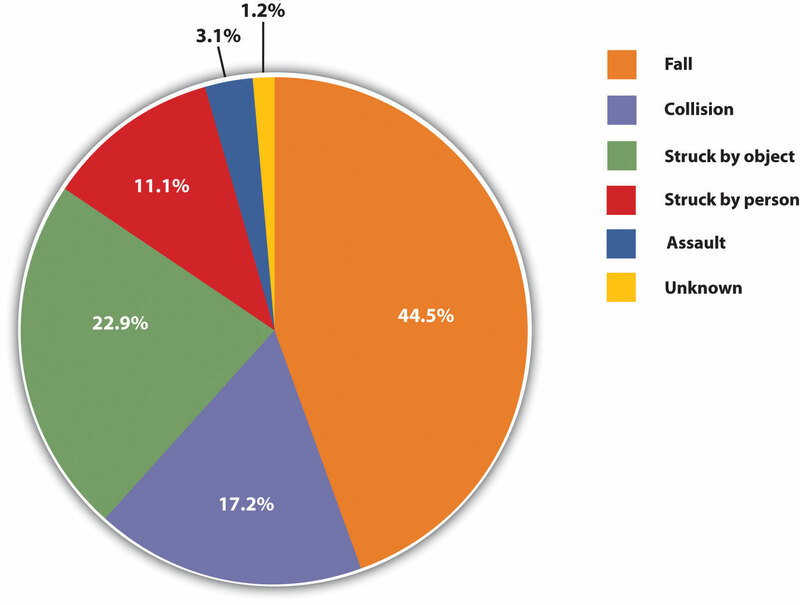 In the pie graph shown in Figure 11: Causes of Concussions in Children, we see a clear and proportional chart that has been color-coded. Color-coding is useful when it’s difficult to fit the explanations in the actual sections of the graph. In this case, you need to include a legend, or key, to indicate what the colors in the graph mean. In this graph, audience members can see very quickly that falls are the primary reason children receive concussions. 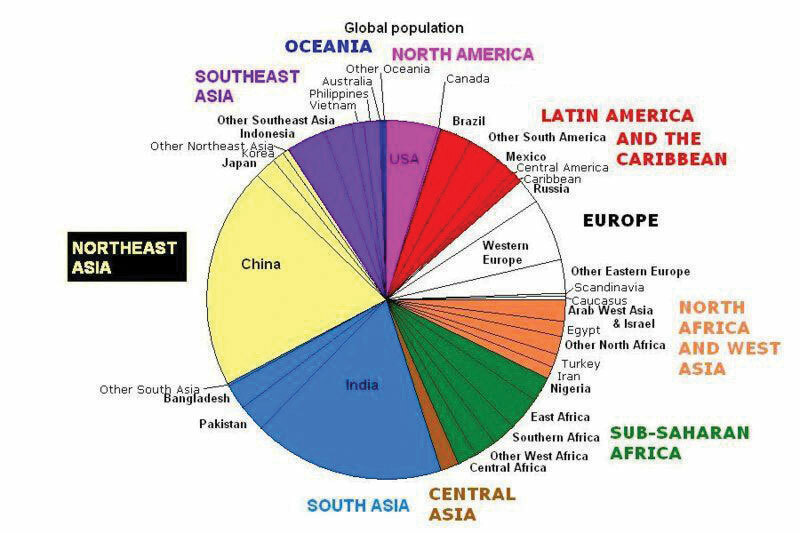 The pie graph in Figure 12: World Populations is jumbled, illegible, confusing, and overwhelming in every way. The use of color coding doesn’t help. Overall, this graph simply contains too much information and is more likely to confuse an audience than help them understand something. In the world of presentation aids, representation is the word used to classify a group of aids designed to represent real processes or objects. Often, speakers want to visually demonstrate something that they cannot physically bring with them to the speech. Maybe you’re giving a speech on the human brain, and you don’t have access to a cadaver’s brain. Instead of bringing in a real brain, you could use a picture of a brain or an image that represents the human brain. In this section, we’re going to explore four common representations: diagrams, maps, photographs, and video or recordings. Diagrams are drawings or sketches that outline and explain the parts of an object, process, or phenomenon that cannot be readily seen. Like graphs, diagrams can be considered a type of chart, as in the case of organization charts and process flow charts. When you use a diagram, be sure to explain each part of the phenomenon, paying special attention to elements that are complicated or prone to misunderstanding. 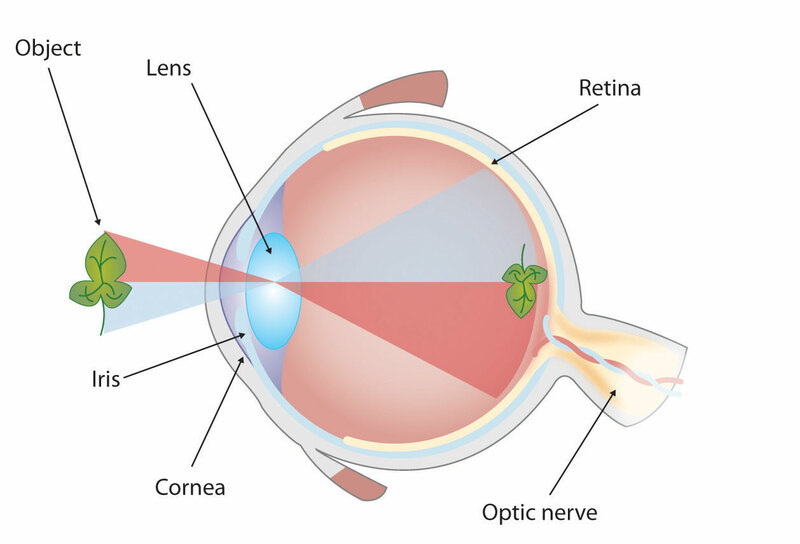 In the example shown in Figure 13: The Human Eye, you might wish to highlight that the light stimulus is reversed when it is processed through the brain or that the optic nerve is not a single stalk as many people think. Maps are useful if the information is clear and limited. There are all kinds of maps, including population, weather, ocean current, political, and economic maps. You should be able to find the right type for the purpose of your speech. Choose a map that emphasizes the information you need to deliver. The map shown in Figure 14: African Map with Nigerian Emphasis is simple. 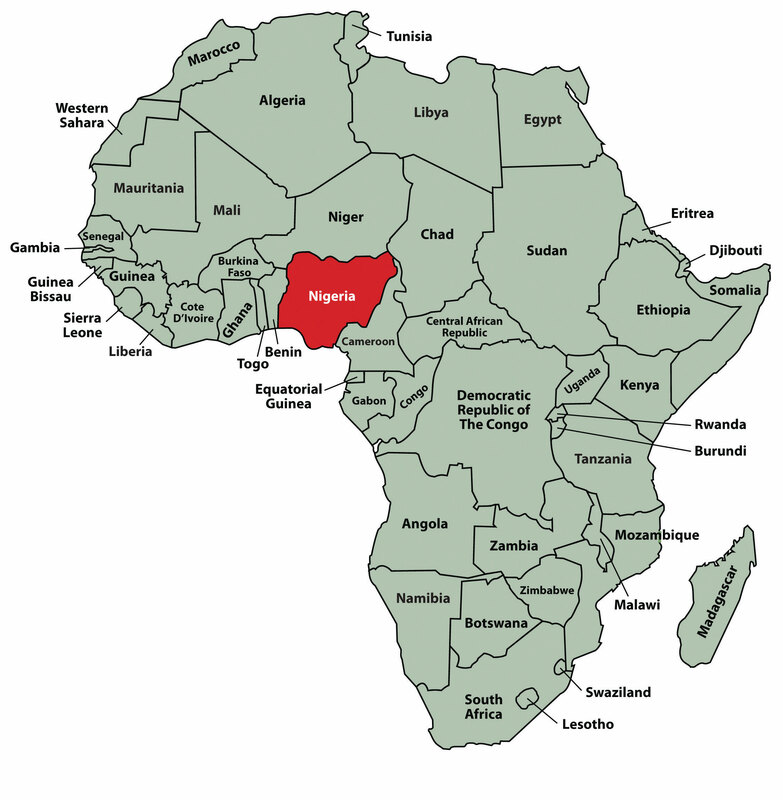 It clearly shows the geographic location of Nigeria. This map can be valuable for some audiences who might not be able to name and locate countries on the continent of Africa. 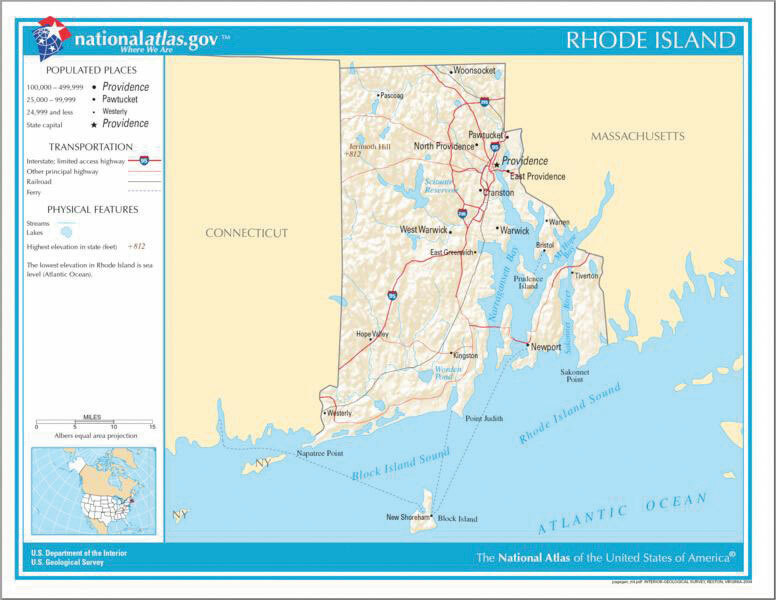 Figure 15: Rhode Island Map is a map of the state of Rhode Island, and it emphasizes the complicated configuration of islands and waterways that characterize this state’s geography. Although the map does not list the names of the islands, it is helpful in orienting the audience to the direction and distance of the islands to other geographic features, such as the city of Providence and the Atlantic Ocean. Sometimes a photograph or a drawing is the best way to show an unfamiliar but important detail. 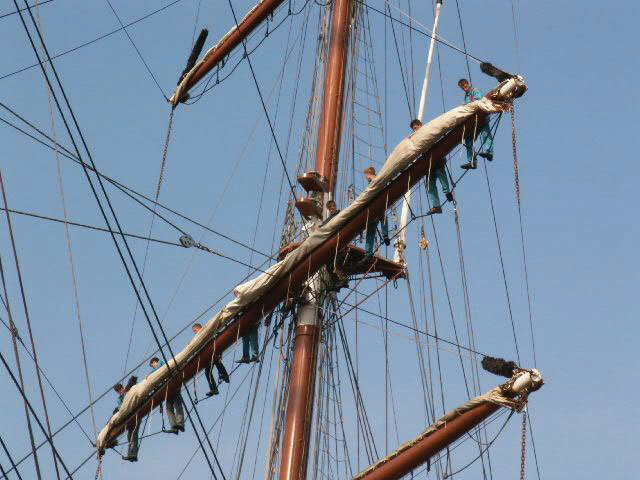 The photograph of the tall ship in Figure 17: Ship’s Rigging could be used to emphasize the sheer amount and complexity of the ship’s rigging. Another useful type of presentation aid is a video or audio recording. Whether it is a short video from a website such as YouTube or Vimeo, a segment from a song, or a piece of a podcast, a well-chosen video or audio recording may be a good choice to enhance your speech. Imagine, for example, that you’re giving a speech on how “Lap-Band” surgeries help people lose weight. One of the sections of your speech could explain how the Lap-Band works, so you could easily show the following forty-three-second video to demonstrate the medical part of the surgery (http://www.youtube.com/watch?v=KPuThbFMxGg). Maybe you want to include a recording of a real patient explaining why they decided to get the Lap-Band surgery. Then, you could include a podcast like this one from the Medical University of South Carolina (http://medicaluniversc.http.internapcdn.net/medicaluniversc_vitalstream_com/podcasts/2007/1_Treado_June_22_final.mp3). Don’t fail to practice with the audio or video equipment before speaking. If you are unfamiliar with the equipment, you’ll have a hard time trying to figure out how it works. Fiddling around with the technology will not only take your audience out of your speech, but it will also have a negative impact on your credibility. Don’t fail to cue the clip to the appropriate place before beginning your speech. We cannot tell you the number of times we’ve seen students spend valuable speech time trying to find a clip on YouTube or a DVD. You need to make sure your clip is ready to go before you start speaking. Objects and models are other forms of presentation aid that can be very helpful in getting your audience to understand your message. Objects refer to anything you could hold up and talk about during your speech. If you’re talking about the importance of not using plastic water bottles, you might hold up a plastic water bottle and a stainless steel water bottle as examples. If you’re talking about the percussion family of musical instruments and you own (and can play) several different percussion instruments, you can show your audience in person what they look like and how they sound. Models, on the other hand, are re-creations of physical objects that you cannot have readily available with you during a speech. If you’re giving a speech on heart murmurs, you may be able to show how heart murmurs work by holding up a model of the human heart. The next category of presentation aids is people and animals. We can often use animals and people, whether it be an animal, ourselves, or another people, to adequately demonstrate an idea during our speeches. The first risk is that animal behavior tends to be unpredictable. You may think this won’t be a problem if your presentation aid animal is a small enough to be kept confined throughout your speech like a goldfish in a bowl or a lizard or bird in a cage. However, even caged animals can be very distracting to your audience if they run about, chirp, or exhibit other agitated behavior. The chances are great that an animal will react to the stress of an unfamiliar situation by displaying behavior that does not contribute positively to your speech. The second risk is that some audience members may respond negatively to a live animal. In addition to fears and aversions to animals like snakes, spiders, and mice, many people have allergies to various animals. You should arrange ahead of time for a person (or persons) to be an effective aid. Do not assume that an audience member will volunteer on the spot. If you plan to demonstrate how to immobilize a broken bone, your volunteer must know ahead of time that you will touch them as much as necessary to splint their foot. You must also be certain that they will arrive dressed presentably and that they will not draw attention away from your message through their appearance or behavior. A chart is a graphical representation of data (often numerical) or a sketch representing an ordered process. A graph is a pictorial representation of the relationships of quantitative data using dots, lines, bars, pie slices, and the like. A representation is a group of aids designed to represent real processes or objects. An object refers to anything you could hold up and talk about during your speech. A model is a re-creation of a physical object that you cannot have readily available with you during a speech. Animals and people can be used as presentations aids to adequately demonstrate an idea during your speech. In keeping with careful choices and effective design, we also have to do a good job in executing presentation aids. They should never look hastily made, dirty, battered, or disorganized. They do not have to be fancy, but they do need to look professional. In this section, we will discuss the major types of media that can be used for presentation aids, which include computer-based media, audiovisual media, and low-tech media. In most careers in business, industry, and other professions for which students are preparing themselves, computer-based presentation aids are the norm. Whether the context is a weekly department meeting in a small conference room or an annual convention in a huge amphitheater, speakers are expected to be comfortable with using PowerPoint or other similar software to create and display presentation aids. If your public speaking course meets in a smart classroom, you have probably had the opportunity to see the computer system in action. Many such systems today are nimble and easy to use. Still, “easy” is a relative term. Don’t take for granted someone else’s advice that “it’s self-explanatory.” Instead, make sure to practice ahead of time. It is also wise to be prepared for technical problems, which can happen to even the most sophisticated computer users. When Steve Jobs, CEO of Apple and co-founder of Pixar, introduced a new iPhone 4 in June 2010, his own visual presentation froze (Macworld, 2010). The irony of a high-tech guru’s technology not working at a public presentation did not escape the notice of news organizations. The world was first introduced to computer presentations back in the 1970s, but these software packages were expensive and needed highly trained technicians to operate the programs. Today, there are many presentation software programs that are free or relatively inexpensive and that can be learned quickly by nonspecialists. Figure 18: Presentation Software Packages lists several of these options. The user needs to take responsibility for the technology used to support the speech. They should not get carried away with the many special effects the software is capable of producing. When creating your presentation aid, rely on the universal principles of good design. These principles include unity, emphasis or focal point, scale and proportion, balance, and rhythm (Lauer & Pentak, 2000). As we’ve mentioned earlier, it’s generally best to use a single font for the text on your visuals so that they look like a unified set. In terms of scale or proportion, it is essential to make sure the information is large enough for the audience to see. Also, since the display size may vary according to the monitor you are using, practice in advance with the equipment you intend to use. The rhythm of your slide display should be reasonably consistent. You would not want to display a dozen different slides in the first minute of a five-minute presentation and then display only one slide per minute for the rest of the speech. In addition to presentation software such as PowerPoint, speakers sometimes have access to interactive computer-based presentation aids. These are often called “clickers.” Clickers are handheld units that audience members hold and that are connected to a monitor to which the speaker has access. These interactive aids are useful for tracking audience responses to questions, and they have the advantage over asking for a show of hands in that they can be anonymous. A number of instructors in various courses use “clickers” in their classrooms. Using computer-based aids in a speech brings up a few logistical considerations. In some venues, you may need to stand behind a high-tech console to operate the computer. You need to be aware that this will physically isolate you from the audience you with whom you are trying to establish a relationship in your speech. When you stand behind presentation equipment, you may feel more comfortable, but you end up limiting your nonverbal interaction with your audience. If your classroom is not equipped with a computer and you want to use presentation software media in your speech, you may bring your computer, or you may be able to schedule the delivery of a computer cart to your classroom. In either case, check with your instructor about the advance preparations that will be needed. At some schools, there are very few computer carts, so it is important to reserve one well in advance. You will also want to see if you can gain access to one ahead of time to practice and familiarize yourself with the necessary passwords and commands to make your slides run properly. On the day of your speech, be sure to arrive early enough to test out the equipment before class begins. Audio presentation aids are useful for illustrating musical themes. For instance, if you’re speaking about how the Polish composer Frederick Chopin was inspired by the sounds of nature, you can convey that meaning through playing an example. If you have a smart classroom, you may be able to use it to play an MP3. Alternatively, you may need to bring your music player. In that case, be sure the speakers in the room are up to the job. The people in the back of the room must be able to hear it, and the speakers must not sound distorted when you turn the volume up. A video that clarifies, explains, amplifies, emphasizes, or illustrates a key concept in your speech is appropriate, as long as you do not rely on it to do your presentation for you. There are several things you must do. First, identify a specific section of the video that delivers meaning. Second, “cue up” the video so that you can just push play, and it will begin at the right place. Third, tell your audience where the footage comes from. You can tell your audience, for instance, that you are showing them an example from the 1985 BBC documentary titled “In Search of the Trojan War.” Fourth, tell your audience why you’re showing the footage. For instance, you can tell them, “This is an example of storytelling in the Bardic tradition.” You can interrupt or mute the video to make a comment on it, but your total footage should not use more than 20 percent of the time for your speech. In some speaking situations, of course, computer technology is not available. Even if you have ready access to technology, there will be contexts where computer-based presentation aids are unnecessary or even counterproductive. And in still other contexts, computer-based media may be accompanied by low-tech presentation aids. One of the advantages of low-tech media is that it is very predictable. There’s little that can interfere with using it. Additionally, low-tech media can be inexpensive to produce. However, unlike digital media, it can be prone to physical damage in the form of smudges, scratches, dents, and rips. It can be difficult to keep a poster professional looking if you have to carry it through a rainstorm or blizzard. You will need to take steps to protect it as you transport them to the speech location. Let’s examine some of the low-tech media that you might use with a speech. If you use a chalkboard or dry-erase board, you are not using a prepared presentation aid. Your failure to prepare visuals ahead of time can be interpreted in several ways, mostly negative. If other speakers carefully design, produce, and use attractive visual aids, yours will stand out by contrast. You will be seen as the speaker who does not take the time to prepare even a simple aid. Do not use a chalkboard or marker board and pretend it’s a prepared presentation aid. It is also worth mentioning that some classrooms and business conference rooms are equipped with smartboards or digitally enhanced whiteboards. On a smartboard, you can bring up prepared visuals and then modify them as you would a chalk or dry-erase board. The advantage is that you can keep a digital record of what was written for future reference. However, as with other technology-based media, smartboards may be prone to unexpected technical problems, and they require training and practice to be used properly. Organize your flip chart in such a way that you flip pages in one direction only, front to back. It will be difficult to flip large pages without damaging them, and if you also have to “back up” and “skip forward,” your presentation will look awkward and disorganized. Additionally, most flip charts need to be propped up on an easel of some sort. If you arrive for your speech only to find that the easel in the classroom has disappeared, you will need to rig up another system that allows you to flip the pages. Some schools also have access to expensive, full-color poster printers where you can create a large poster for pasting on a foam board. In the real world of public speaking, most speakers rely on the creation of professional posters using a full-color poster printer. Typically, posters are sketched out and then designed on a computer using a program like Microsoft PowerPoint or Publisher (these both have the option of selecting the size of the printed area). First, make sure to bring enough copies of the handout for each audience member to get one. Having to share or look on with one’s neighbor does not contribute to a professional image. Under no circumstances should you ever provide a single copy of a handout to pass around. There are several reasons this is a bad idea. You will have no control over the speed at which it circulates or the direction it goes. Moreover, only one listener will be holding it while you’re making your point about it and by the time most people see it, they will have forgotten why they need to see it. In some case, it might not even reach everybody by the end of your speech. Finally, listeners could still be passing your handout around during the next speaker’s speech. There are three possible times to distribute handouts: before you begin your speech, during the speech, and after your speech is over. Naturally, if you need your listeners to follow along in a handout, you will need to distribute it before your speech begins. If you have access to the room ahead of time, place a copy of the handout on each seat in the audience. If not, ask a volunteer to distribute them as quickly as possible while you prepare to begin speaking. If the handout is a “takeaway,” leave it on a table near the door so that those audience members who are interested can take one on their way out. In this case, don’t forget to tell them to do so as you conclude your speech. It is almost never appropriate to distribute handouts during your speech, as it is distracting and interrupts the pace of your presentation. If your handout is designed for your audience to follow along, you should tell them to do so. State that you will be referring to specific information during the speech. Then, as you’re presenting your speech, ask your audience to look, for example, at the second line in the first cluster of information. Read that line out loud and then go on to explain its meaning. As with any presentation aid, handouts are not a substitute for a well-prepared speech. Ask yourself what information your audience needs to be able to take with them, and how it can be presented on the page in the most useful and engaging way possible. As we’ve seen earlier in this chapter, impressive presentation aids do not take the place of a well-prepared speech. Although your presentation aids should be able to stand on their own in delivering information, do not count on them to do so. Work toward that goal, but also plan on explaining your presentation aids so that your audience will know why you’re using them. One mistake you should avoid is putting too much information on an aid. You have to narrow down the topic of your speech, and likewise, you must narrow down the content of your presentation aids to match your speech. Your presentation aids should not represent every idea in your speech. Whatever presentation aids you choose to use, they should fulfill one or more of the functions described at the beginning of this chapter: to clarify or emphasize a point, to enhance retention and recall of your message, to add variety and interest to your speech, and to enhance your credibility as a speaker. As a practical matter regarding producing presentation aids, you may not be aware that many college campuses have a copy service or multimedia lab available to students for making copies, enlargements, slides, and other presentation aids. Find out from your instructor or a librarian what the resources on your campus are. In the rest of this section, we will offer some tips for designing good-quality presentation aids. The first rule of presentation aids is that they must be accessible for every audience member. If those in the back of the room cannot see, hear, or otherwise experience a presentation aid, then it is counterproductive to use it. Graphic elements in your presentation aids must be large enough to read. Audio must be loud enough to hear. If you are passing out samples of a food item for audience members to taste, you must bring enough for everyone. Do not attempt to show your audience a picture by holding up a book open to the page with the photograph. Nobody will be able to see it. It will be too small for your listeners in the back of the room, and the light will glare off of the glossy paper usually used in books with color pictures so that the listeners in front won’t be able to see it either. Text-based visuals, charts, and graphs need to be executed with strong, clean lines and blocks of color. Weak lines in a graph or illustration do not get stronger with magnification. You must either strengthen those lines by hand or choose another graphic element that has stronger lines. On a poster or a slide, a graphic element should take up about a third of the area. This leaves room for a small amount of text, rendered in a large, simple font. The textual elements should be located closest to the part of your graphic element. Carefully limit the amount of text on a presentation aid. If a great deal of text is absolutely necessary, try to divide it between two slides or posters. Many students believe that even small text will magnify amply when it’s projected, but we find that this is rarely the case. We can’t recommend a specific point size because that refers to the distance between the baselines of two lines of text, not to the size of the type itself. We recommend two things: First, use a simple, easy-to-read font style. It doesn’t have to be utterly devoid of style, but it should be readable and not distracting. Second, we recommend that you print your text in three or four sizes on a sheet of paper. Place the printed sheet on the floor and stand up. When you look at your printed sheet, you should be able to make a choice based on which clusters of font you are able to read from that distance. You should be able to carry your presentation aids into the room by yourself. In addition, you should be skilled in using the equipment you will use to present them. Your presentation aids should not distract you from the delivery of your speech. For our purposes, aesthetics refers to the beauty or good taste of a presentation aid. Earlier we mentioned the universal principles of good design: unity, emphasis or focal point, scale and proportion, balance, and rhythm. Because of wide differences in taste, not everyone will agree on what is aesthetically pleasing. You may be someone who does not think of yourself as having much artistic talent. Still, if you keep these principles in mind, they will help you to create attractive, professional-looking visuals. Aesthetics refers to the beauty or good taste of a presentation aid. The other aesthetic principle to keep in mind is that your presentation aids are intended to support your speech, not the other way around. The decisions you make in designing your visuals should be dictated by the content of your speech. If you use color, use it for a clear reason. If you use a border, keep it simple. Whatever you do, make certain that your presentation aids will be perceived as carefully planned and executed elements of your speech. Use text only when you must. For example, if you’re presenting an analysis of the First Amendment, it is permissible to display the text of the First Amendment, but not your entire analysis. The font must be big, simple, and bold. It needs white space around it to separate it from another graphic element or cluster of text that might be on the same presentation aid. When you display text, you should read it out loud before you go on to talk about it. That way, you won’t expect your listeners to read one thing while trying to listen to something else. However, under no circumstances should you merely read what’s on your text aids and consider that a speech. If you create your graphic images, you will have control over their size and the visible strength of the lines. However, you might want to show your listeners an illustration that you can’t create yourself. For instance, you might want to display a photograph of a portion of the Dead Sea Scrolls. First, find a way to enlarge the photograph. Then, to show integrity, cite your source. You should cite your source with an added caption, and you should also cite the source out loud as you display the graphic, even if your photograph is considered to be in the public domain. The NASA photograph “Spaceship Earth” is such an example. Many people use it without citing the source, but citing the source boosts your credibility as a speaker, and we strongly recommend doing so. PowerPoint is a hybrid between the visual and the written. When we pay attention to the design of our writing—to whether we are putting key word at the beginning or end of a sentence, for instance—we are likely to communicate more effectively. In the same way, it makes sense to understand the impact that PowerPoint’s design has on our ability to communicate ideas to an audience (Stoner, 2007). While this article is specifically about PowerPoint, Stoner’s advice works for all presentation software formats. Presentation aids should deliver information that is important or is difficult to present with spoken words only. Although many speakers attempt to put their entire speech on PowerPoint slides or other visual aids, this is a bad idea for several reasons. First, if you try to put your entire speech on PowerPoint, you will lose contact with your audience. Speakers often end up looking at the projected words or directly at the computer screen instead of at their audience. Second, your vocal delivery is likely to suffer, and you will end up giving a boring reading, not a dynamic speech. Third, you will lose credibility, as your listeners question how well you know your topic. Fourth, you are not using the presentation aids to clarify or emphasize your message, so all the information may come across as equally important. No matter what presentation software package you decide to utilize, there are some general guidelines you’ll need to follow. One of the biggest mistakes novice users of presentational software make is thinking that if you can read it on the screen, your audience will be able to read it in their seats. While this may be the case if you’re in a close, intimate conference room, most of us will be speaking in situations where audience members are fifteen feet away or more. Make sure each slide is legible from the back of the room where you will be speaking. In addition to watching your font size, you also need to watch how you use words on the screen. Do not try to put too much information on a slide. Make sure that your slide has the appropriate information to support the point you are making and no more. We strongly recommend avoiding complete sentences on a slide unless you need to display a significant direct quotation. Remember, presentation software is an aid, so it should aid and not hinder your presentation. We have seen too many students who only end up reading the slides right off the screen instead of using the slides to enhance their presentations. When you read your slides right off the projector screen, you’re stopping your eye contact. As a general word of advice, if you ever find yourself being forced to turn your back to the audience to read the screen, then you are not effectively using the technology. On the flip side, you also shouldn’t need to hide behind a computer monitor to see what’s being projected. Color is very important and can definitely make an impact on an audience. However, don’t go overboard or decide to use unappealing combinations of color. For example, you should never use a light font color (like yellow) on a solid white background because it’s hard for the eye to read. You should also realize that while colors may be rich and vibrant on your computer screen at home, they may be distorted by a different monitor. While we are in favor of experimenting with various color schemes, always check your presentation out on multiple computers to see if the slide color is being distorted in a way that makes it hard to read. Everyone who has had an opportunity to experiment with PowerPoint knows that animation in transitions between slides or even on a single slide can be fun, but often people do not realize that too much movement can distract audience members. While all presentation software packages offer you very cool slide movements and other bells and whistles, they are not always very helpful for your presentation. If you’re going to utilize slide transitions or word animation, stick to only one or two different types of transitions in your whole presentation. Furthermore, do not have more than one type of movement on a given slide. If you’re going to have all your text come from the right side of the screen in a bulleted list, make sure that all the items on the bulleted list come from the right side of the screen. It is vital to practice using the technology. Nothing is worse than watching a speaker stand up and not know how to turn on the computer, access the software, or launch their presentation. When you use technology, audiences can quickly see if you know what you are doing, so don’t give them the opportunity to devalue your credibility because you can’t even get the show going. Lastly, always have a backup plan. Unfortunately, things often go wrong. One of the parts of being a professional is keeping the speech moving in spite of unexpected problems. Decide in advance what you will do if things break down or disappear right when you need them. Don’t count on your instructor to solve such predicaments; it is your responsibility. If you take this responsibility seriously and checked the room where you will be presenting, you will have time to adapt. If the computer or audiovisual setup does not work on the first try, you will need time to troubleshoot and solve the problem. If an easel is missing, you will need time to experiment with using a lectern or a chair to support your flip chart. If you forgot to bring your violin for a speech about music—don’t laugh, this actually happened to a friend of ours!—you will need time to think through how to adapt your speech so that it will still be effective.